Castorbean is a shrub or small tree originating in tropical Africa and now widely distributed and cultivated for the oil in its seed, which has a range of industrial uses. It is fast-growing, herbaceous when young, with age becoming woody and forms either a shrub or tree depending on the variety. Some trees reach heights of up to 12 m (40 ft), though between 3 and 5 m (10 and 16 ft) is more common. In tree form, the trunk is slender with smooth grey-white or light-brown bark and supports a rounded crown with a moderate number of large leaves. 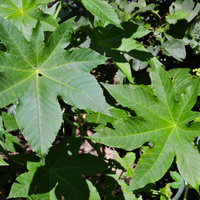 Leaves large, from 30 to 60 cm (1 to 2 ft) wide and star-shaped with seven to nine serrate, pointed lobes. 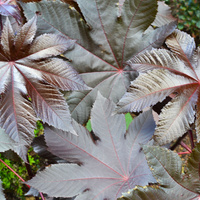 These emerge bronze, gradually become green with age, or wine-red in some varieties, and attach to the branches with a long hollow leaf stalk. Flowers unisexual, small, greenish and borne on conical flower spikes 15 to 60 cm (0.5 to 2 ft) long, the male flowers situated below the females. These bloom on and off throughout the year but are at their fullest from spring to summer and are followed by burr-like seed capsules, blue-green or red when young, turning brown when mature with three brown or black mottled seed inside. When fully mature, the seed capsule bursts open scattering the seed. Castorbean comes in many varieties, differing in plant size, foliage colour, seed capsule size, as well as seed size, shape and colour. The seed yield on cold pressing a colourless to pale yellow, viscid oil known as 'Castor oil' or 'Palma Christi oil'. On hot pressing, the oil is brown to near black. 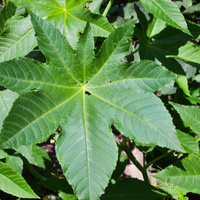 Ricin, a highly toxic protein poisonous to humans and animals is present in the seed but is not passed to the pressed oil. Oil yields are around 35 to 60% of the seed by weight. The leftover seedcake contains about 5% nitrogen, 2% phosphate and 1% potash and is mostly used to fertilise crops. 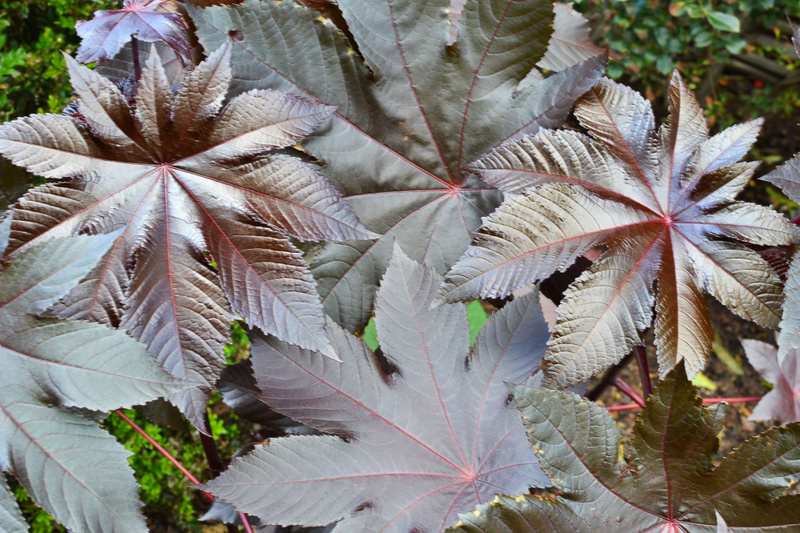 It can also be fed to livestock if it is first heat treated to destroy the ricin. Castor oil has application in the lubricant, biofuel, chemical, textile, cosmetic, pharmaceutical, surface coating, and soap-making industries. The oil maintains a constant viscosity at high temperatures making it a suitable lubricant, hydraulic fluid and brake fluid for machinery and moving parts operating under various temperature and pressure conditions. It has reportedly been successfully engine-tested as a Biodiesel. Castor oil is commercially processed into Polyamide 11, a thermoplastic in the nylon family of polymers. Polyamide 11, also known as Nylon 11 is used in high-pressure hoses (particularly those used in the oil and gas industry), automotive tubing, electrical cables, textiles, footwear, as well as metal coatings (for noise reduction and to protect against corrosion). The oil also has plasticizing properties, which promotes plasticity, flexibility and reduces brittleness in materials. This has led to it being used in plastics to make them more malleable or mouldable and in resins to make surface coatings, which can range from paint or varnish to nail polish. In the cosmetic industry, it is used in face- or peeling-masks, shaving cream, bath oils, hair-grooming products, lipstick and nail polish removers. In the confectionery industry, it is used as an anti-sticking coating and release agent in hard candy, and in pharmaceuticals as a protective coating in pills. Soap with castor oil has increased lathering power, is highly soluble in cold water, and owing to its exceptional clarity, is used in making transparent soaps. It has been estimated that more than half of all lipstick sold in the United States contains castor oil as an ingredient. 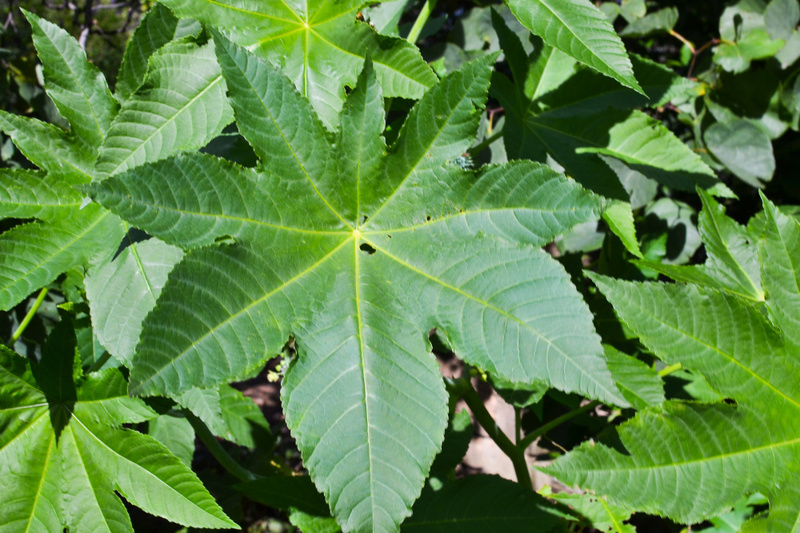 In India, Castor oil is prescribed for nervous disorders and it is well known for its strong laxative and purgative action, particularly in the treatment of food poisoning as well as in excavating the bowel before X-ray examination. The flower clusters are highly susceptible to fungal disease brought on by humid conditions. Castorbean grows naturally and is most productive in sub-humid to moderately humid subtropical and tropical climates, generally in frost-free areas with annual lows of 15 to 25 °C, annual highs of 26 to 36 °C, annual rainfall of 700 to 2000 mm and a dry season of 3 to 7 months. Castorbean is also grown with irrigation in low rainfall areas with a long dry season. In fact, it is cultivated with irrigation in the Indian states of Gujarat and Rajasthan, in areas receiving only 300 mm annual rainfall and with a long dry season lasting up to 9 months. New plants are usually started from seed, which germinate readily. Performance is best on friable, free-draining loam and sand soils of a moderately acid to alkaline nature, generally with a pH of 5 to 8 and on sites with full to partial sun exposure. Sowing is in the rainy season and is timed so that flowering occurs at the start of the dry season, thereby minimising the risk of fungal attack. Castorbean takes from four to seven months to mature after sowing, with the seed-capsules harvested when they become yellowish, which is when they are ripe but not fully mature. They are then left in shallow piles in the sun to dry, which takes about four to five days. 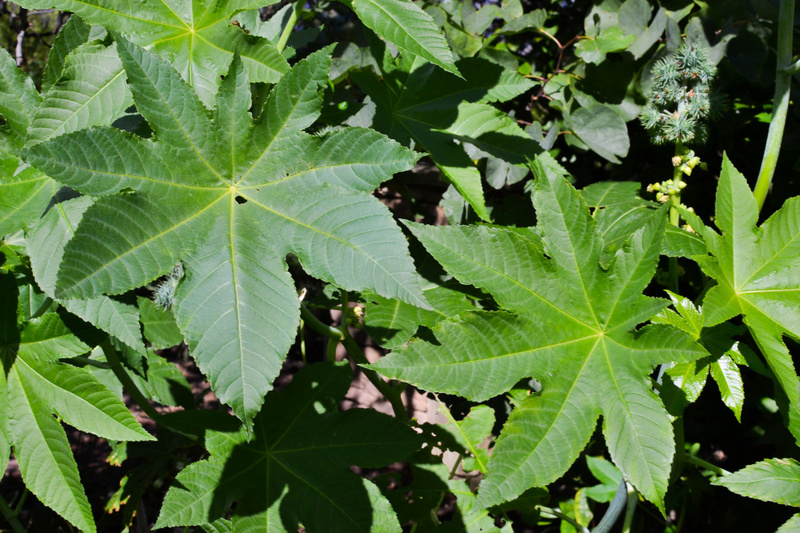 The seed contain ricin, a poison that is extremely toxic to humans and livestock. Castorbean trees bear seed profusely and these are scattered when the seed capsule bursts open. It is recorded as an invasive species in more than one country and is assessed as a high weed risk species for Hawaii and South Florida, respectively by the Hawaii Pacific Weed Risk Assessment project (HPWRA) and the IFAS Assessment of Non-Native Plants in Florida's Natural Areas. Pollen produced by the male flowers is known to cause hay fever in some people.